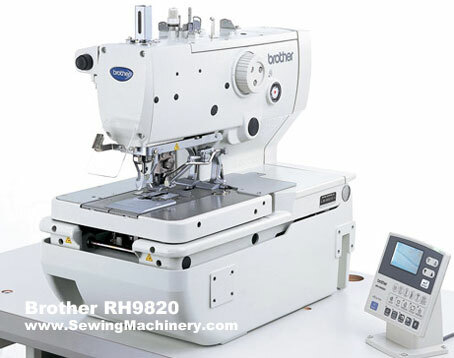 Brother RH-9820 Electronic eyelet button hole sewing machine with the worlds highest maximum sewing speed of 2500spm. The maximum sewing speed of 2,500 rpm has been achieved by the adoption of an optimal machine structure for high speed drive. The speed is significantly enhanced from the former 2,200 rpm level. By enhancing the rigidity of the needle bar-area parts (patent pending) and having the feed mechanism and needle bar rotating mechanism servo-controlled, the operating time has been reduced, resulting in 13% reduction of the machine time compared with the conventional model. Fine finishing of button holes.